It has been years since Joshua the Scribe, Lon the Vampire, Jasmine the Neuroman, and Beauty the Centaur journeyed to save their lost families from the strange Queen in the City With No Name. And as time went on, they were visited by ghosts of themselves, sometimes aiding in their quest and sometimes just a haunting presence. But were they really ghosts? Or were they simply incarnations of their own souls, visiting from another time to learn from them as well as to teach and to save their own world from the imminent destruction of the Timefall? In this climactic denouement to the dystopian future envisioned in World Enough, and Time and Time's Dark Laughter, the first two books in this trilogy, a new Joshua and friends fall through a complex weave of time tunnels, landing in the terrain of the first adventures. But to their dismay, they discover that the fates of both times are interdependent, and the new world's Joshua must enlist forces from the old to save the whole tipping universe from extinction. 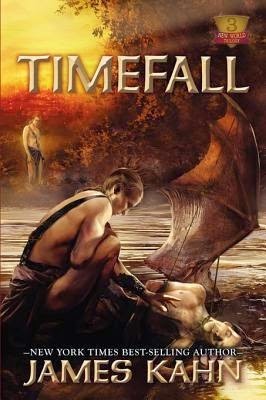 After requesting Timefall from Netgalley, I bought and read the first two in the series; World Enough, and Time and Time's Dark Laughter. With the exception of the last two pages which threw me into something unexpected, I thoroughly enjoyed both. I wasn't disappointed with Timefall. It starts with the discovery of a very ancient skull and an expedition to learn more about its origins. Joshua and his friends find hidden civilizations and fight to prevent the end of everything by the end of time itself. Lots of action and so many themes from the first two books echo through this one. I also enjoy Kahn's prose. As I found in Incarnate his pacing and choice of words lure you in so when the action comes, it feels like you've passed through something solid. Even in contemporary settings, there is a sense of the fantasy. I was concerned that since Timefall is set in the current day there would be a big sense of disconnect from the previous novels. For me, there wasn't. I loved the moments of recognition of characters and events echoed from the previous books. I'm not certain of the science of time as presented in Timefall, it's not my specialty, but since the characters believed it and it was presented so simply and plausibly, I was able to follow. Had I read this series when it was first printed, I would have been glad to pick it up as a re-read as I have with so many other great science fiction and fantasy series from my past, rediscovering it. The experience would have been very different for me then, than it is now. Joshua, Lon and Jasmine would be understood differently and for me they would have been different people then. Much like the Joshua, Lon and Jasmine in Timefall are fundamentally similar to their doppelgängers in World Enough, and Time and Time's Dark Laughter. Thank you to Netgalley and Dover Publications for the opportunity to read this book.